We made it! We took old Route 66 slowly and enjoyed our trip across country! We are settled and happily living in Waynesville, North Carolina. We had planned on living in Asheville, but we found the cutest place right off Main Street in Waynesville. It’s close to T.J.’s new school and he can walk right around the corner to the ice cream shop! That’s a big deal for him! My Javiee found a job at a fantastic restaurant right around the corner from our house. It seems like everything has just fallen into place for us. It’s all been so easy. I feel like it was meant to be. I’m at peace with our decision to move. It’s so good to be closer to family! My test results from this week aren’t in yet so I don’t know what my tumor marker is now. I know I feel good! I still take pain meds for my body aches and I still can’t feel my fingers. It’s hard to write or even type. I figure that’s something I’m going to be dealing with forever. I’ve learned to take that in stride, what else can I do? Thank you all for the well wishes! I feel blessed that your all part of my life and this road I travel! Now I have to tell you T.J. started middle school!! I cried like a baby! There was a time when I thought I wouldn’t live to see him go to middle school. It was a big deal for me! Here’s a picture from his first day! Here’s one from our road trip. 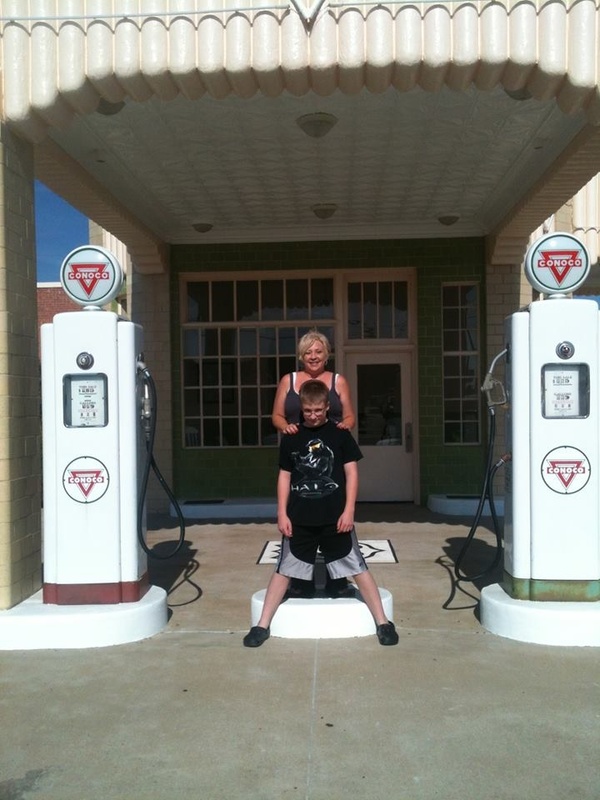 It was the old Conoco Station from the movie Cars. (One of T.J.’s fav stops on our trip) I love road trips! See that blonde hair? It didn’t come back that way! I did it to put a little kick back in my step! I mean really! I’m dealing with enough, couldn’t my hair have come back blonde?! ← Just a quick post! I live right outside of Asheville. I’m feeling a lunch and ice cream day in our future. No way! We will have to do that! How exciting! I am so thrilled for you that the move and all it entailed felt so meant-to-be! and also that you were able to find that wonderful, new oncologist. enjoy every minute of all your good fortune – you DESERVE IT! It does feel good to have that piece of mind Sara! I loved your pictures of you dancing! I’m so happy you made your trip! Your always an inspiration! You can come visit! I hear it’s really great here in October when the leaves start changing! You are so funny girl! I am do happy to hear things are working out for you guys:) Arvin’s will never be the same without you guys and Terry. Miss you bunches ! My grandpa died yesterday so rough road but it cheered me up to see such positive words from you! Keep us updated please ! Thanks Tammy! Have you guys made your trip to Mexico yet? Hey girl! Woohoo! So happy to hear your good news. With all the bullcrap this disease brings we have to truly savor the good moments and the times that things do work in our favor. I think about you often and keep rooting for more good days ahead. Big hugs. Thank you Terri! I think of you often also! I’m so glad your feeling better! I know how hard it was for you to decide on taking those treatments!